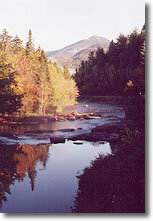 Most people travel through the Adirondacks, during late September and early October, specifically to see spectacular autumn scenery and to experience the warm hospitality that pervades the small towns of upper New York State, an area roughly bounded by Interstates I-81 - I-90 and I-87. But you really want to get off the Interstates as quickly as possible because one of the most relaxing vacations one can take is to leisurely explore this land of 6.1 million acres of wilderness areas, lakes, high mountains, abundant wildlife and small communities. As one old -time resident said, “Ma’am, you just gotta slow down, breath deep and fill your eyeballs with what we folks take for granted”. Towns like Scroon Lake, Elizabethtown, Jay, Keene, Wilmington, Lake Placid, Saranac Lake, Blue Mountain Lake, North River and Indian Lake have been welcoming visitors to the area since the 1890's. Mom & Pop restaurants serve great food. General stores and hardware stores cater to local needs. Specialty shops offer Adirondack and twig furniture, soft wool blankets, flannelette bedding, jams, jellies and other products specific to the area. What some people might not realize, because they are so busy being leaf peepers, is that there are a number excellent attractions to enjoy, some natural such as Whiteface Mountain, Ausable Chasm and High Falls Gorge; some man-made like Santa’s Workshop at North Pole, NY, a place which almost makes those of a certain age - anyone over eight years old - believe once again in Santa Claus and the magic of Christmas. 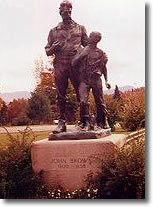 North Pole is on Rt.#431, Whiteface Veterans Memorial Highway, approximately one mile northwest of Rt.#86 in Wilmington which is ten miles north and east of Lake Placid. While many people only associate the jolly old man with Christmas, North Pole, NY presents Santa in a most attractive setting, and makes him readily available to children of all ages. Don’t think that Santa’s Workshop is only for families with small children. It isn’t. One of the most enjoyable aspects of the attraction is watching both children and adults experience the happiness and memories that are woven into a visit. One of the best times to enjoy Santa’s New York base is when autumn’s brilliant palate compliments the site’s great layout. Santa’s Workshop began more than sixty years ago after a young girl enjoyed a storybook so much that her father undertook a virtual recreation then opened it to the general public. 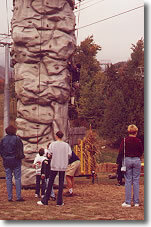 The attraction was developed to compliment its location with its treed hills, rock ledges and clear mountain streams. 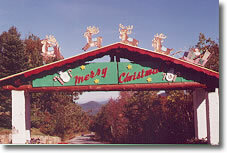 Over the years North Pole, NY has evolved until today it is one of the premier North American “Santa” attractions. Everything about the site is quality. Shows, geared toward children’s musical tastes and attention spans, are staged in the Jack Jingle Puppet Theatre and at the Yuletide & Sam n’ Sandy’s Show Place outdoor theatres. 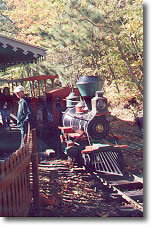 Thrills such as the Sleigh Ride Coaster, Reindeer Carousel, the Candy Cane Express are included in the price of admission so children can ride as often as they wish. Adults love to “toodle” on the Candy Cane Express pointing out where secretive forest fairies and leprechauns live - you can tell by the doors on magical trees, don’t you know? 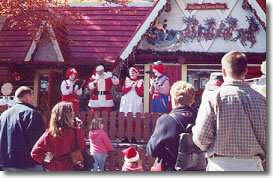 Santa’s Workshop is anchored by a Frosty North Pole which is located right outside Santa’s House that he shares with Mrs. Claus. Children love visiting and having their pictures taken with these accommodating folks. Santa’s House can only be described as magical. Everything in it is in a slightly smaller-than-normal scale so that children aren’t intimidated by size. Santa doesn’t only confine his appearances to his house. At any given time you might find him standing by the North Pole, chatting with visitors or in the barn - feeding his reindeer. Yes, you can pat Santa’s flying herd - Dasher, Dancer, Prancer, Vixen, Comet, Cupid, Donner and Blitzen. And you can sit in his sleigh. You can also visit the Animal Nursery & Critter Corner to see some of the smaller furry animals that inhabit the forest. Santa’s helpers man the workshops of the Hat & Stocking Maker, the Candy Maker, Glassblower and Toymaker. 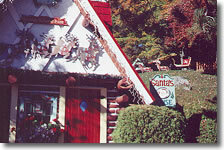 Stops at Tannenbaum - “The Talking Christmas Tree”, the Blacksmith and the World of Christmas Gift Shop are a must. On your travels, costumed characters from some of the most beloved children’s books roam the grounds. Be prepared for hugs all-round! “Merry Christmas” is the greeting of choice, and so nice to hear too. One of the nicest things about Santa’s Workshop and North Pole, NY is that, while Santa is important, the owners haven’t overlooked the true Christian meaning of Christmas. This is expressed and presented very well with a nativity display in St. Nicholas Chapel and with a live Nativity Pageant performed on a hill overlooking the Yuletide Theatre. A special lean-to barn has been constructed for the production. When you’re hungry, Mother’s Hubbard’s Country Kitchen Restaurant and Jack Spratt’s Snacks are ready to serve you. 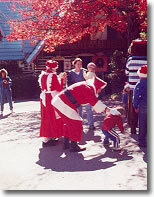 Mother’s Hubbard’s is also arranged so that Santa can be “in attendance” on special occasions and during inclement weather, which can happen occasionally on a mountain. The last stop on your visit to Santa’s Workshop should be a visit to Elmer Elf’s Wishing Well where the wish of many visitors is to return to North Pole, NY. Another of the more overlooked Adirondack attractions is the John Brown Farm State Historic Site, just outside Lake Placid. Some might associate abolitionist John Brown with the song “John Brown’s Body Lies a Mouldering in the Grave”. But the song was originally not written about John Brown of Harper’s Ferry fame. This and a lot of other interesting facts are brought to the fore by staff when you visit John Brown’s farm, the site of his burial after his hanging on December 2, 1859. For those of you who aren’t familiar with John Brown’s life, one of your stops at the farm should be at the barn for a video presentation. Brown was a man ahead-of-his-time. He came to the North Elba area, which includes Lake Placid and Mirror Lake, in 1849 to assist with the establishment of an African community by the name of Timbuktu, on land donated by Garret Smith. Brown surveyed the land then stayed to help free Africans to build houses and plant crops. The Brown family settled on 240+ acres of land overlooking both Whiteface Mountain and the Keene Valley areas. In total, he had two wives and twenty children, all committed to their father’s cause. In 1837, Brown, born in Torrington, Connecticut, made a vow to do all he could to abolish slavery. A man of loyalty and fierce commitment, he quickly became passionate and fanatical in his battle, knowing full well that he was up against an “institution” that came to the colonies with the Jamestown settlement in 1619 and which was well entrenched by the 1800's with an estimated four million enslaved people. In committing to abolishing slavery Brown put himself in leagues with the likes of Frederick Douglas and Harriet Beecher Stowe, author of “Uncle Tom’s Cabin”. By 1851 Brown had left his wife on the farm in New York State and made his way to Kansas, a hot bed for both slavery and the anti-slavery movements. 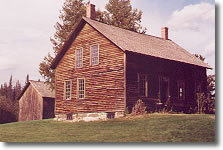 After 1851 he visited his farm in New York State only seven times. His name wouldn’t have become such a household word if he hadn’t initiated an ill- conceived attack on the Depot/Armory at Harper’s Ferry in what is today West Virginia. When Brown’s plans went awry - his supporters didn’t materialize - he was captured, imprisoned in Charleston, tried and hung. 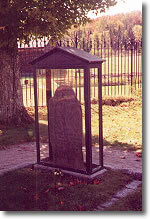 At his request, his body was returned to his hill farm in New York State for burial. Twelve comrades-in-arms were buried with him, two of them his sons, both killed at Harper’s Ferry. Mrs. Brown moved from the farm in 1863. By 1895 a group of twenty individuals had purchased the property and given it to the State of New York. Along with the restored house and barn, there are a number of memorials on the property - John Brown’s grave - plaques to Brown and his followers - a plaque to the women of the Brown family who were staunch in their support of his cause - a stone monument to the twenty far-sighted people who saved the farm from development and a Joseph P. Pollia bronze statue of John Brown with his hand protectively on the shoulder of a young slave. The song, “John Brown’s Body . . .” was originally not written about this John Brown but it quickly became associated with him. It was improvised as a marching song by a young Scotsman in the Massachusetts Volunteer Militia who shared the same name. In 1861 a “spin-off” occurred when Julia Ward Howe heard the song sung in Washington, D.C. and not thinking the words worthy, wrote “The Battle Hymn of the Republic” to accompany the tune. Unfortunately, the original Scottish John Brown didn’t live to hear Howe’s verses. He was killed early in the Civil War - drowned in the Shenandoah River at Front Royal, Virginia. Another of Adirondack’s more interesting attractions combines leaf-peeping with a train ride. 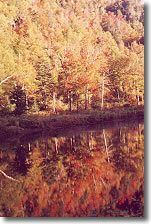 The Adirondack Scenic Railroad offers a number of autumn and themed excursions. The train travels through some of the most scenic landscape in the region. And who can resist the sound of a train whistle echoing through the idealistic mountains and valleys of Upper New York State. 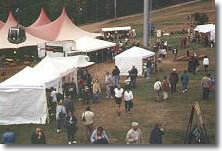 If visiting the Wilmington area during the first weekend in October, Whiteface Mountain Ski Area on Rt.#86 holds their annual and most popular Oktoberfest with German singers, bands, dancers and foods, including a pig roast. Outdoor and indoor vendors offer crafts unique to the area. Children activities are scheduled throughout the weekend. Costumed characters right out of Germany’s Black Forest, roam the grounds. Magicians perform their tricks to the delight of young and old. 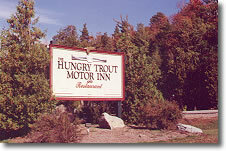 Although there are lots of accommodation choices, consider staying at The Hungry Trout Motor Inn, on Rt.#86 between Lake Placid and Wilmington. It offers great rooms and excellent food at two restaurants - R.F. McDougall’s “a civilized saloon” with an Adirondack-inspired atmosphere, and the classy Hungry Trout Restaurant. This motor inn complex is located right next to “The Gorge” which is lit up at night, Whiteface Mountain Ski Area, Ausable Chasm and the eight-mile-long Veterans Memorial Highway to the top of the 4,865 foot Whiteface Mountain whose “gateway to the sky” is approx. one mile beyond Santa’s Workshop on Rt.#431. The Hungry Trout Motor Inn is several miles from Santa’s Workshop and not far from John Brown’s Farm and the Scenic Railroad. Adirondack’s highways, by-ways, small towns and villages demand leisurely exploration especially when autumn spreads its glorious colour across the landscape. Be sure to get a comprehensive package of information, including maps, so that you can plan your trip before leaving home. The area tends to have lots of visitors - especially during the autumn foliage weeks, Christmas holidays and ski season. Make accommodation reservations in advance of any trip. 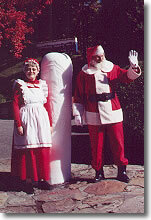 Don’t forget your list for Santa Claus and be sure to mail some postcards from North Pole, NY.